Behind the new organ in the nave. CAPT N. G. CHAVASSE V.C. WITH BAR M.C. 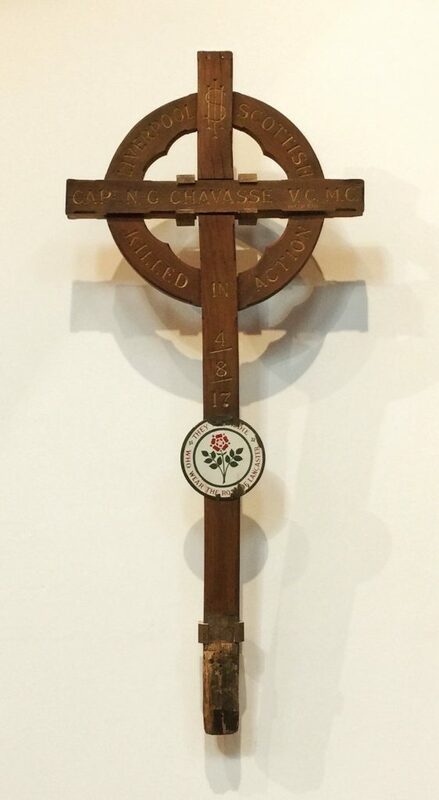 Noel Godfrey Chavasse was the younger of identical twin boys born to the Rev. Francis Chavasse (later Bishop of Liverpool and founder of St Peter’s College, Oxford) and Edith Jane Chavasse (née Maude) on 9 November 1884 at 36 New Inn Hall Street, Oxford. Christopher Maude was born 20 minutes before his brother. In all, there were seven children born to the Chavasse family, in age order: Dorothea, Christopher, Noel, Edith, Mary, Francis and Aidan. The twins were so small and weak at birth that their baptism was delayed until 29 December 1884 and both were very ill with typhoid in their first year of life. Chavasse was educated at Magdalen College School in Cowley Place, Oxford, where a blue plaque was dedicated to him in 2005, Liverpool College and Trinity College, Oxford. The family grew up in Oxford until, on 3 March 1900, Rev. Chavasse was offered the Anglican Bishopric of Liverpool. The move was not without regrets as Liverpool during this time was one of the busiest seaports in the Empire and also had a great deal of religious turmoil in progress. The family moved to the Bishop’s Palace at 19 Abercromby Square, Liverpool. Noel and Christopher went to school at Liverpool College where they excelled at sports from the start. Their academic progress was initially rather slower but as they grew older, both did well until in 1904, both were admitted to Trinity College, Oxford. In 1907, Noel graduated with First-class honours but Christopher failed, leading to a nervous breakdown. Both of them stayed at Oxford, Noel to study medicine and Christopher to retake his exams. During their time at Trinity, both men had not neglected their sports, rugby union being a favourite of theirs. In 1908, both twins represented Great Britain in the Olympic Games in the 400 metres. Noel finished third in his heat while Christopher finished second, neither time being fast enough to progress further. In January 1909, Noel joined the Oxford University Officers’ Training Corps Medical Unit. By the following May, he was promoted to Lance-Sergeant. Noel finished his studies at Oxford in July 1909 and returned to Liverpool to continue his studies under such eminent teachers as Sir Robert Jones who went on to become a leading authority in orthopaedic surgery. On returning to Liverpool, Chavasse resumed his connection with the Grafton Street Industrial School, an institution for homeless boys in Liverpool. In the autumn, he went to London to sit his examination for Fellowship of the Royal College of Surgeons. He failed, apparently because of ill health. When he sat the examination again in May 1910, he passed it with ease. Christopher, in the meantime, was well into his studies for the ministry under his father’s guiding hand. Noel progressed through his studies having studied pathology and bacteriology. As part of his course, he was obliged to undertake a hospital “placement”. He found a position at the Rotunda Hospital in Dublin. Whilst Chavasse liked Dublin, his first experience of living in a Roman Catholic community disturbed him. In January 1912 Chavasse passed his final medical examination, and was awarded the university’s premier medical prize, the Derby Exhibition, in March that year. On 22 July 1912, Noel registered as a doctor with the General Medical Council. His first placement was at the Royal Southern Hospital in Liverpool, initially until 31 March 1913 and then for a further six months. He then became house surgeon to Robert Jones, his former tutor. In early 1913, after discussions with some of his fellow doctors, Chavasse applied for and was accepted by the Royal Army Medical Corps (RAMC); he was commissioned as a lieutenant on 2 June. Thanks to one of his mentors, Dr McAlistair, who was then Surgeon-Captain of the 10th Battalion of the King’s (Liverpool Regiment), the Liverpool Scottish, he was attached to the battalion as Surgeon-Lieutenant. The 10th Kings had been a Territorial battalion since the Haldane Reforms in 1909. Chavasse joined the battalion on 2 June 1913 and was welcomed by Lieutenant-Colonel W. Nicholl, the commanding officer. As an officer in a Territorial unit, Chavasse now had to attend to both his civilian and military duties. 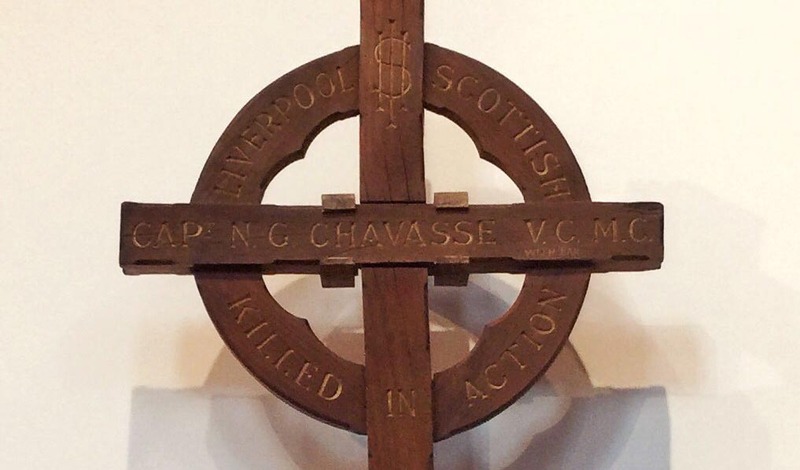 During the First World War, Chavasse was a captain with the Royal Army Medical Corps, British Army attached to the 1/10th (Scottish) Battalion of the King’s (Liverpool Regiment). Chavasse was awarded the Military Cross for gallantry at Hooge, Belgium in June 1915, although the award was not gazetted until 14 January 1916. He was promoted captain on 1 April 1915; on 30 November 1915 that year he was Mentioned in Despatches. Medals of Noel and Christopher Chavasse. Noel’s medals are top row. Christopher’s medals are bottom row. Chavasse’s headstone in Brandhoek New Military Cemetery. Chavasse was the only man to be awarded both a Victoria Cross and Bar in the First World War, and one of only three men ever to have achieved this distinction. 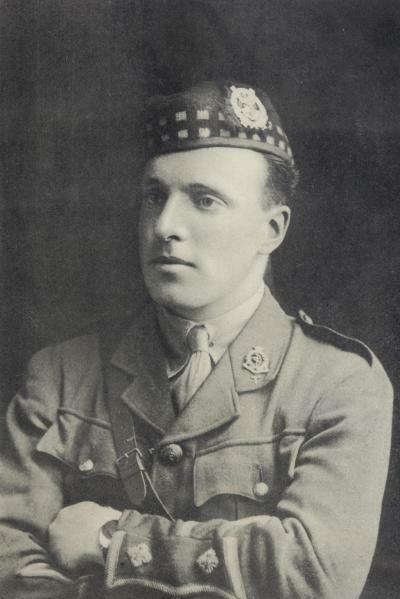 At the time of his death, Chavasse was engaged to one of his cousins, Frances Gladys Ryland Chavasse (1893–1962), daughter of his uncle Sir Thomas Frederick Chavasse (1854–1913) of Bromsgrove, a surgeon. Noel’s engagement is mentioned on a plaque at the Chavasse family grave at Bromsgrove. Gladys Chavasse was mentioned in despatches 1945 at Monte Cassino, Italy, and killed in 1962 in an accident in France while crossing the road.